This Black Self Defense Kit includes both a stun gun and a pepper spray with case. 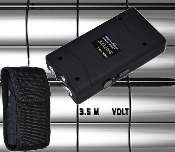 Black Stun Gun - Takedown Gear's new "Stunner" is one of the smallest, yet most powerful, stun guns that you can imagine. It is only 4.25" x 2.25" (about the size of a cigarette pack) and delivers a whopping output of 5,500,000 volts. Good enough to knock down almost anybody! No need to worry about loosing the charging cord because this unit has a built-in charger that plugs directly into a standard wall socket. Leave it plugged in overnight, and grab it as you leave in the morning for protection all day. The bright LED flashlight can be operated independently of the stun gun, so you're never without a light in an emergency. The included free nylon belt case makes it perfect for someone who likes to carry something to protect themselves anywhere and anytime! Black Pepper Spray w/ Case - Police Magnum OC-17 Pepper Spray offers the most powerful concentration of pepper spray allowed by law. This is the same spray used by police officers. Each unit also includes UV dye for later identification of the perpetrator by law enforcement. The handy unit allows for one hand operation and can be used to provide multiple blasts up to 12 feet away. A suspect will be immediately affected with burning skin, coughing, watery eyes, runny nose, difficulty breathing but will have no permanent injuries. It is both non-toxic and non-flammable. Effective against: muggers, carjackers, rapists, vicious animals, etc.. The included leather case features a keychain attachment.